Historical buildings of Kendal, Cumbria. 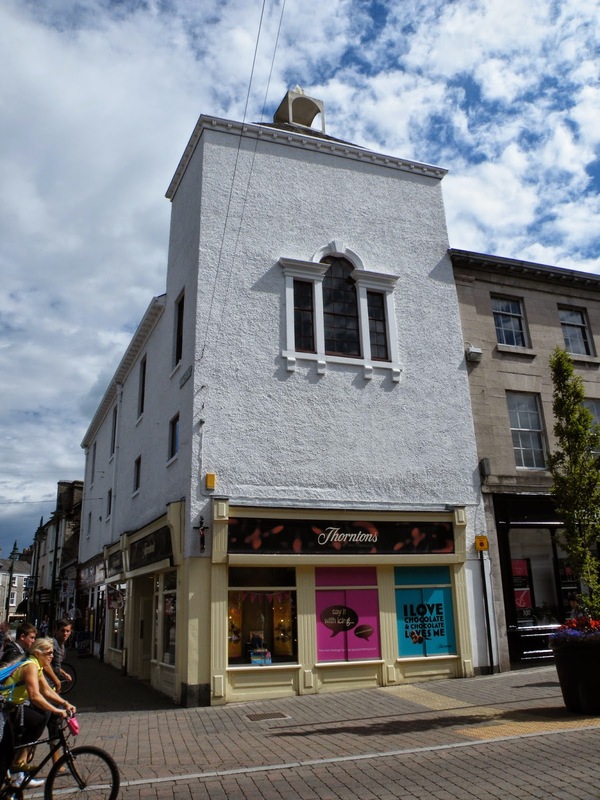 Kendal is littered with interesting, quirky and architecturally valuable buildings. From the oldest inhabited building in the town, the Castle Dairy, to the shops on Highgate, Strickland Gate and Kirkland, Kendal has many gems.....some hidden, some plain to see. Here are some photos of some of these buildings, along with a little information. Situated at the West end of Stramongate, the house is reputed to have been built in 1546, although the date stone now mounted above the central dormer window is now disputed. 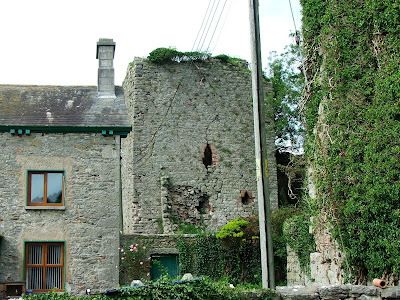 Certainly built sometime in the 16th century, it was originally erected as a town house for the Bellingham family, a local well known land owning dynasty. Above. The yard of number 7, with water pump and stable building at the rear. Above. 7 Stramongate was Henry Robert's Book shop. A local story tells us that part of the house was later occupied by Agnes Harker, Captain Cook's sister, though much research has yet to prove that Captain Cook had a sister called Agnes. Interestingly though, Henry Roberts was a sailor who served with Captain Cook on HMS Discovery. 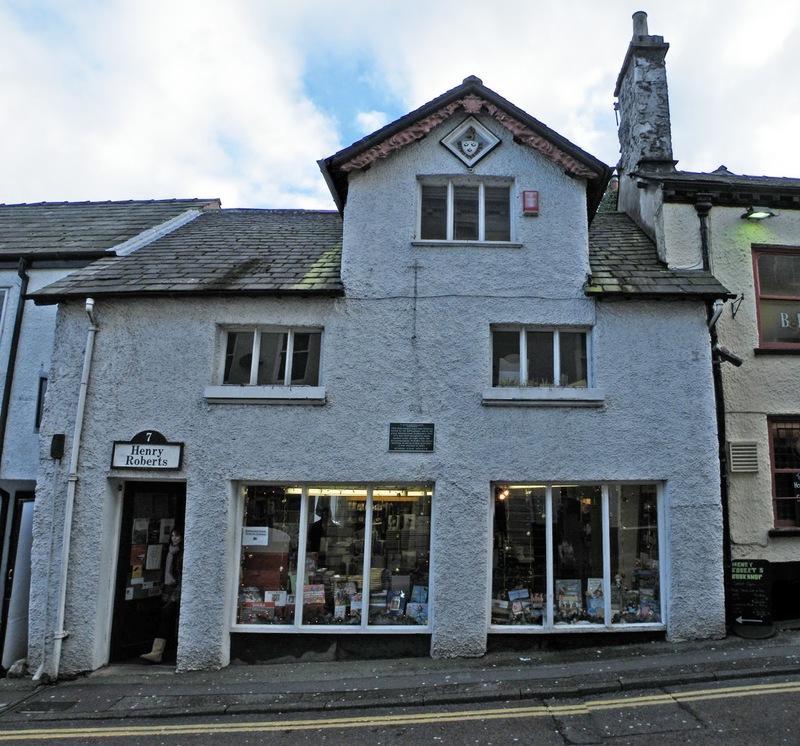 The house is probably the oldest building in Kendal, still used as shop premises. In 1985, the property was restored to its current condition. The house was built in 1769 and is now used as a hotel. Above the door way onto the street, the following inscription has been discovered: TO THE DWELLERS IN THIS PLACE GOD GRANTE PEACE. The building we see today, Pear Tree Barn, was built in 1845, but there was a chapel on this site before then. Above. Plaque showing the date the chapel was rebuilt and converted. The Inghamites were a Calvanistic sect started by Benjamin Ingham after he broke away from the Church of England. Locally, the Inghamites were not much liked, and they were not allowed burial anywhere in the town. 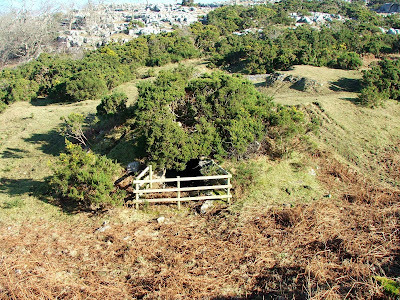 The Inghamites managed to purchase a small pocket of land at the top of Beast Banks, about a hundred yards from the chapel, and they used this as their burial ground until it was closed in 1855. The chapel has been converted to flats now. The Kendal Bank of Maude, Wilson and Crewdson opened on the 1st of January 1788, on the same day as Wakefield's Bank in Stricklandgate. 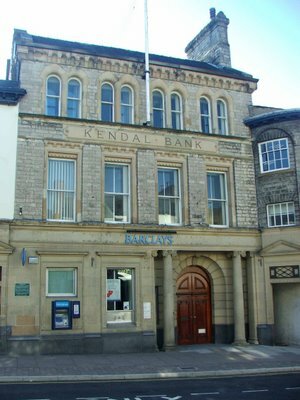 When the two banks joined forces in 1840, they eventually moved to the purpose built Kendal Bank building in 1873. The firm merged with the Bank of Liverpool , which in turn became Martin's Bank in 1928, eventually becoming Barclays Bank in 1969. Kendal Bank was licenced to print its own money at one point. In 1797, when the Bank of England was unable to pay in gold coinage, at the height of the war with France, the bank issued its own banknotes, called Promissory notes. Many high ranking local businessmen and politicians put their hands to a document in February of 1826, stating that they had every faith and trust in the Kendal Banks, and that they would gurantee money lodged with the banks. Originally built in 1591, the Moot hall was erected as a town hall, administrative centre of the town, court house and gathering place when the castle was no longer used or usable. It was one of Kendal's timber and stone constructions. It contained offices and the 'Court Loft' where offenders were often kept before they were tried in the courts below. In 1712, on the 11th of October, the Moot hall was the scene of debate, when the magistrates of Kendal summoned surveyors of the town's roads to appear before them. The session was called to discuss why the surveyors had not made essential repairs on the Barony's roads. In 1729, the hall was almost entirely rebuilt, with new windows, a courtroom and an upper storey with a cupola and clock. The Moot hall was used for court proceedings as well. For example, for the taking of oaths in support of the current monarch: "Summons from Daniel Wilson, John Archer and Anthony Askew to Thomas Shipherd, George Hilton, John Hale, John Burrow and William Clawson, all of Beetham, to appear at the Moot Hall in Kirkeby Kendall, to take the oaths prescribed for the further security of his Majesty's person and Government and the succession of the Crown in the heirs of the late Princess Sophia, being protestants, and for extinguishing the hopes of the pretended Prince of Wales and his open and secret abbettors. Dated 15 December, 1715. Similar summonses to Mrs. Askew, widow in the island in Applethwaite, Miles Atkinson and Benjamin Harrison both of Applethwaite, James Longmire de Linefitt, James Longmire de Orrest, John Longmire de Calgarth and George Elleray de Houe of Applethwaite, Robert Stephenson of Newhouse and George Dennison of Mirehead, both in Grayrigg, Samuel Newby of Tenterden in Docker and Thomas Dawson of Crosthwaite. Dated 15 December, 1715. 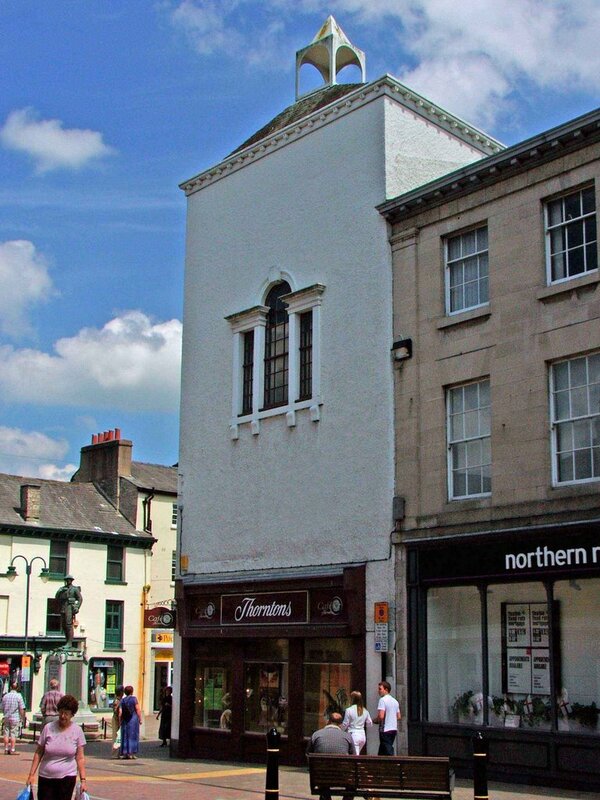 The Moot Hall was used as the Town Hall and courtrooms until 1859, when Kendal Corporation purchased the White Hall Assembly rooms at the top of Lowther street and moved their administrative offices there. The ground floor of the Moot Hall was converted to shops with some storage and living quarters onthe first floor. A small police station was also situated here. The top floor of the building was used as the Council Chamber until 1836. Under the market place, the 'Black Hole', a primitive lock up, was situated.....used until this time (1836) when a replacement was built in the new police offices in Old Police Office Yard on Finkle Street. The clock, seen on many old black and white photos of the building, hung from the cupola from 1840 until 1861, when it was donated to the church of St Thomas at the foot of Windermere Road, where it remains to this day. The original building burned down in 1969 (?) and the replacement was designed to look as close to the original as possible. The original Venetian windows of 1729 are still in situ, shown below. Photos that I've seen of the main street seem to suggest that the current building is a pretty good representation of the original!! Many of us will remember it housing Thorntons, now a jewellers, it's a hidden gem in that it's history isn't known by many people. 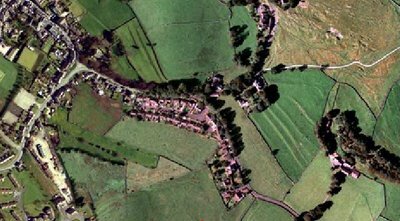 Dotted around the Cumbrian countryside, in fields, at roadsides, on country walks and in the middle of nowhere, you can find lime kilns. Not limited to the Cumbrian landscape, these relics can be found all over the country. So far I've only managed to photograph a few local kilns, but there's more to come. 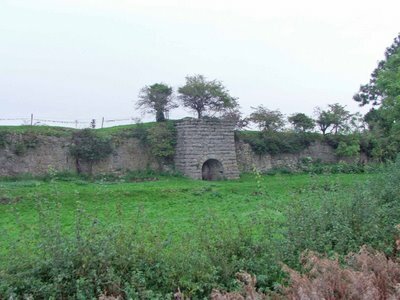 Lime kilns were used from medieval periods right through to the 18th and 19th centuries. They were used for in earlier times for the production of mortar for building purposes, and sometimes, as during the 18th and 19th centuries, for the production of lime for agricultural purposes. 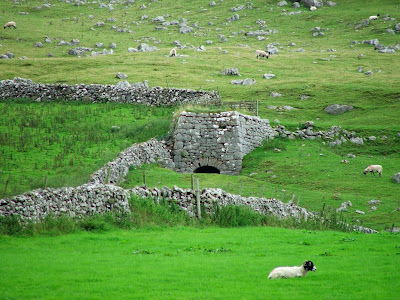 This kiln lays in a field about a mile off the A591, sandwiched between Natland and Brigsteer. It is about a hundred yards from the deserted medieval settlement. It is fairly intact, except for the collapsed roof. 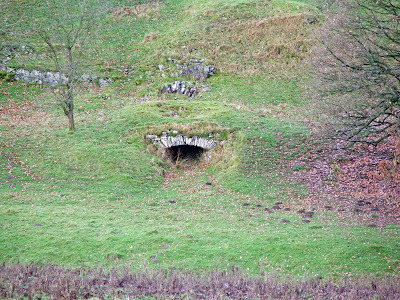 The lime kiln on the Cunswick Scar lays about two miles into the walk leading to Cunswick Hall. 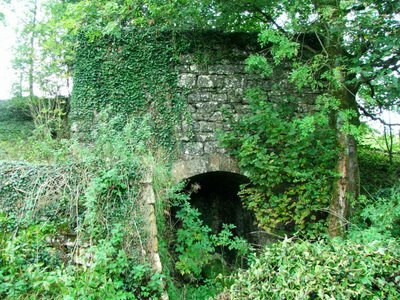 The lime kiln is almost totally intact, and looks to be in excellent condition. It's off the beaten track so has probably escaped any stone robbing. 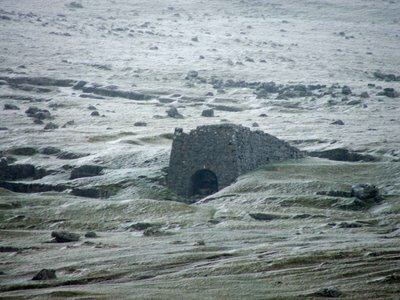 These lime kilns lay half way up the fell side on Wild Boar Fell just off the A683 about 6 miles South of Kirkby Stephen. They're in a remote position on the fell side and again look in pretty good condition. 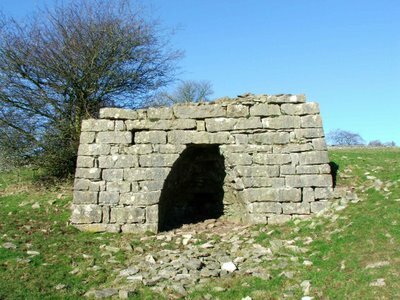 This lime kiln lays about 200 yards off the A65 on the South side of the road, at the foot of a steep and narrow hill on the B road heading towards Hutton Roof. The kiln is very overgrown, but in really good condition. I only noticed this by chance as I was making my way to the earthworks outside Hutton Roof. 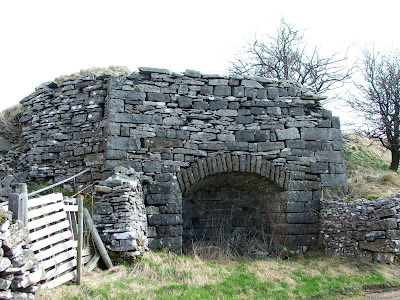 This lime kiln can be seen from the dual carriageway (A590) as you're travelling towards Kendal. 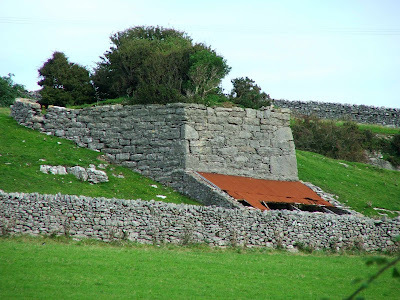 The kiln sits in the field on your left, built into a lime stone escarpment. Again, the kiln is in excellent condition. During the summer months, it's pretty much hidden by the roadside hedgerows. 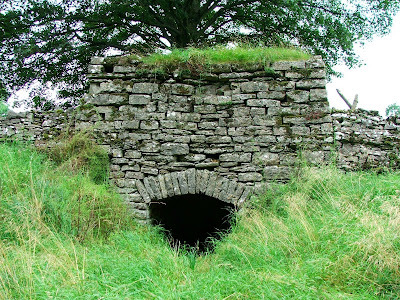 At last, I've photographed this rather sorry lime kiln just outside Ingleton. The mostly buried remains are about 100 yards west of the B6255 on Storrs common. The entrance to the kiln is full of grass covered rubble, but a quick look inside proved it to be in very good condition. The kiln was in use in the 1840's, though its date of construction is not known. 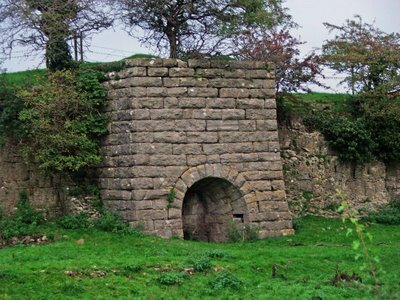 The area surrounding this kiln, known as Storrs Common, has probably been quarried for centuries, providing good quality lime stone for building and lime production. This was probably the last kiln to be built on the common, and is the only survivor found to date. 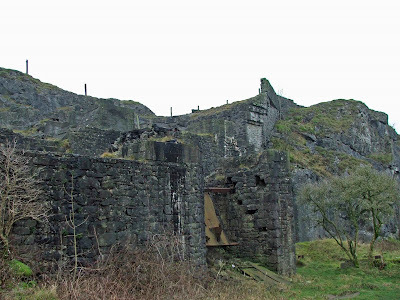 The quarry works in Ingleton are in a poor state. There are a lot of remains at the site, but what's there is pretty ruinous. 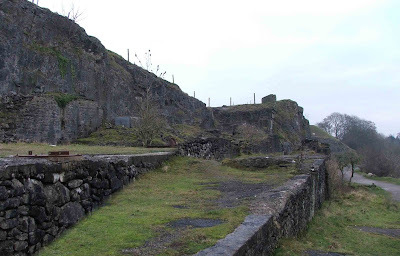 The kiln is situated on the east banks of the River Doe, on the opposite side of the river to the main part of Mealbank quarry. Its likely that the kiln mostly used lime quarried from the smaller quarry above it, but this would need to be confirmed. 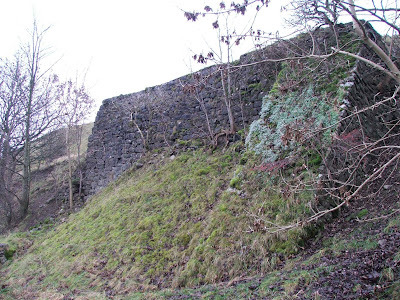 The remains also include the infilled ruins of a large kiln built into the hillside to the South of the works. Infilled lime kiln to the South of the quarry works. 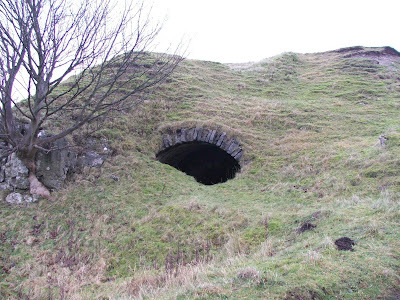 About two miles West of the quarry works and Storrs Common, there is a Hoffman Kiln built by the Craven Lime Company. 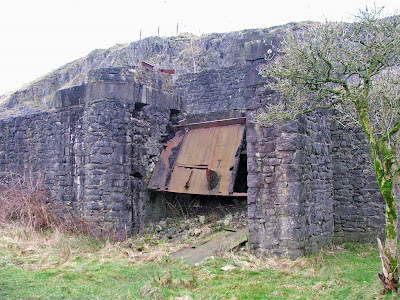 Two brothers from Austwick, John Clark and Michael Wilson purchased the Meal Bank quarry in 1864, obtaining their license to build a Hoffman kiln four years later in 1868. 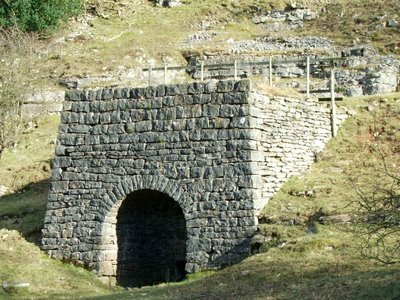 This was the first Hoffman kiln to be built in the North of England, and at its peak, was producing between 40 and 60 tons of high grade lime a day. 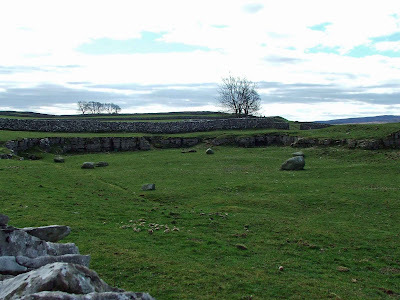 My next trip to Ingleton will be to grab some photos of the remains. 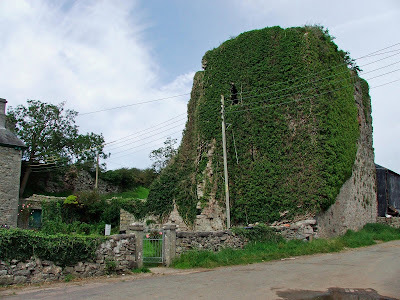 Just outside the village of Gleaston, and about a mile and ahalf from Gleaston Castle, this lime kiln, in pretty good condition, still stands in the fields overlooking the B road to the village. The farmer has obviously converted the kiln for farm use, but apart from the obvious changes, it's in excellent condition. 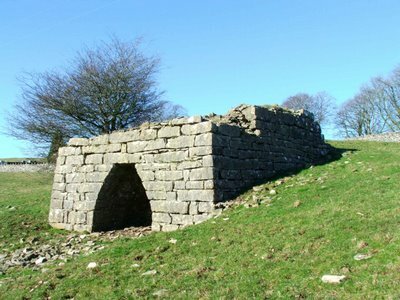 Holme Park Fell lime kiln. Another fine example of a Cumbrian lime kiln, this time somewhat overgrown, but in good condition. 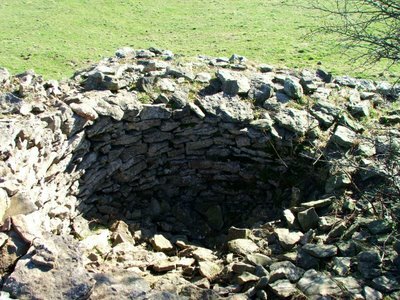 This limekiln can be found on Holm Park Fell, which is about two miles to the South of Fareleton Knot, and a mile and a half East of the village of Holme. I only stumbled on this one really, as it's off the beaten track and as you can see....it's overgrown and well hidden. 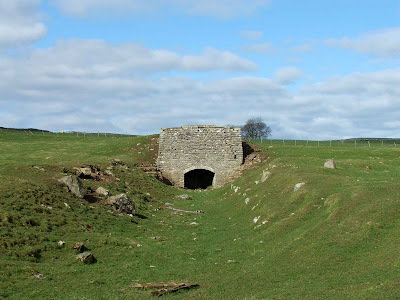 Dotted around the fells near Shap abbey, are numerous lime kilns of varying condition. Here are a few that were easily photgraphed. 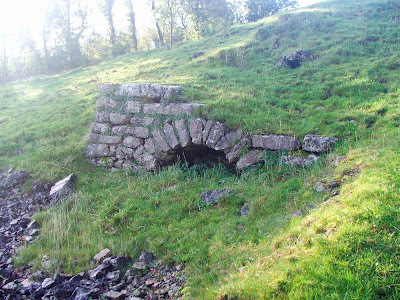 The first kiln, shown below, is known to date from the mid to late 19th century, and has ramps on the sides, leading to the top of the kiln. In quite good condition. 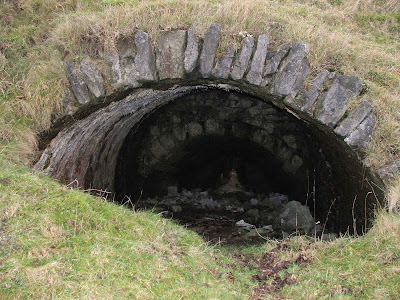 The next kiln, shown below, was also in good condition, with a shallow trackway leading to the entrance. The next kiln lay in a shallow 'quarry', perhaps 3 or 4 feet deep, from which lime stone was possibly removed for processing. There were a number of other kilns that weren't photographed....I'll save them for another day. The area is littered with lime stone outcrops, clearly indicating that the area was ripe for lime stone quarrying. 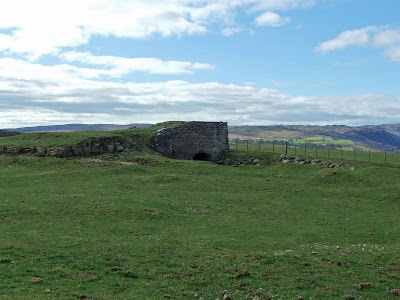 With Arnside Tower being located along the Limestone Link Walk from Beetham to Kirkby Lonsdale, it's no surprise to find a few lime kilns along the way. This one is situated right underneath the imposing ruins of Arnside Tower, and probably dates from sometime in the early 18th century. Partly collapsed and full of rubble, it's a tiny variation on a theme that is common around these parts, with limestone pavements exposed at almost every turn. I only spotted this lime kiln by accident, tiny as the opening is, and damaged and fairly well hidden. It's only visible from the East banks of the River Kent as it passes through Levens Park. Judgin by the damage on the top, and the silting up of the entrance, I would say that this kiln regularly gets flooded by the Kent. Sad as this may sound, I've only just discovered this lime kiln photo in my library. I know that it's from the Ravenstonedale area, and I know that I took it in September last year...but apart from that, at the moment at least, I don't know where it is. As soon as I've worked out where it is situated, I'll have a little more information on it. 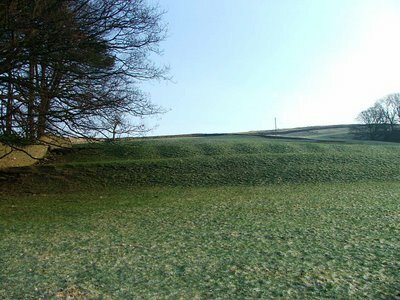 In a field at the junction of the B6255 and the Clapham Old Road in Ingleton, a series of 5 medieval cultivation terraces can still be seen in the field to the North of the road. As can be seen from the above aerial photograph, the terraces are extremely well preserved, and are accompanied in the landscape by another group of terraces above and to the left.These terraces were probably created during the 13th or 14th centuries, and would have been built to make better use of a sloping area of arable land. The terraces would have made it easier for the medieval farmer to make use of the land. 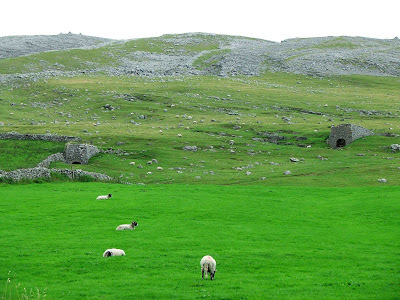 The Ingleborough Park terraces survive to about a metre high, and each terrace is around five to six metres in width, running the whole length of the present day field. Gleaston Castle is situated about two miles West of Aldingham, with Scales to the North and Gleaston to the South. The castle sits in a field attached to a large farm. It is not accessable due to the ruinous state of the remains, but can be viewed extremely clearly from the road to the East. Above. View of the South East tower. 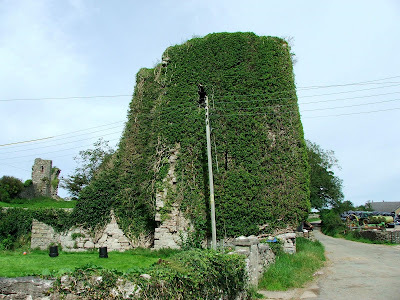 In 1297 John de Harrington I, Lord of Aldingham and Muchland began the construction of what is now the South-west Tower and part of the west wall ending with another tower, although the site had been inhabited since the early part of the 13th century. 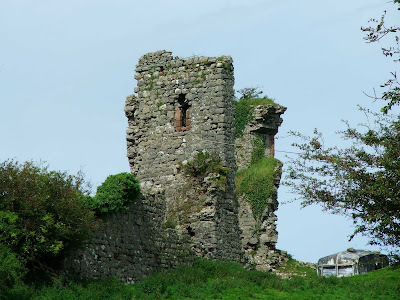 In 1325, the building of the present day castle was started by either John de Harrington I or his son John de Harrington II. The building work was completed in around 1340. The castle was inhabited by the de Harrington family for 118 years until, in 1457, William de Harrington, last Lord Harrington of Aldingham and Muchland, died with no heir. The castle and estate passed to Lord William Bonvilla and eventually passed by marriage to Thomas Grey, great-grandfather of Lady Jane Grey. It was during this time that the castle gradually fell into rapid decay. Thomas Preston purchased the castle and ‘renovated’ one of the towers in which he lived for a number of years. Above. Another view of the South East tower. The Preston family retained ownership of the castle until around 1639 when it seems that a Richard Gaitskell was living in the castle, possibly occupying one of the South towers. He may have occupied the site until the 1690's. 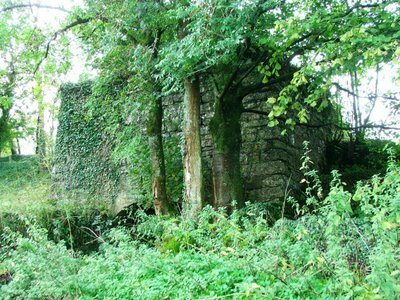 The ruin later passed to the Cavendish family, and was sold by Lord Richard Cavendish of Holker Hall to Thomas Barton Jackson, of Bolton Manor, Urswick, a local farmer, on the 14th February 1920. It was bought by William Simpson Webster Snr in 1926 and is currently owned by his son, William Simpson Webster Jnr and is still part of a working farm.The castle is a very simple lay out, with a large curtain wall running the full circuit of the castle, two corner towers, one at the South West corner and one a the South East corner, a large keep at the North West corner, and a gateway through the East wall. The state of the remains vary considerably. The keep is fairly ruinous and now consists of two ruined walls with no roof. The corner towers have both been incorporated into the farm buildings, and are still fairly solid. 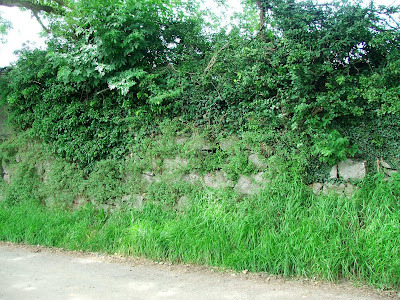 The curatin wall on the road side has been demolished and only a dry stone walls survives in its place. The North wall and the South wall are both now gone, and only portions of the West and East wall survive. 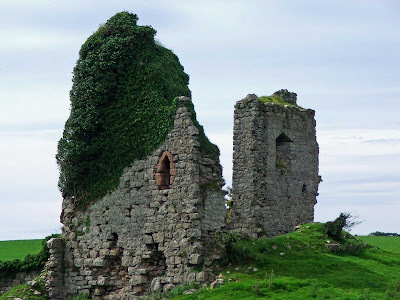 All in all, it's a spectacular castle, with substantial, if ruined, remains. Above. View of the South West tower. Near to this site are the remains of Aldingham motte and bailey castle, and Aldingham Grange, the remains of a moated manor house. 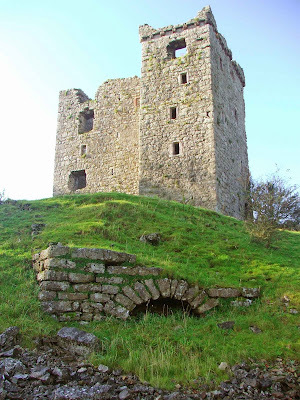 2007 photos of Gleaston Castle. Above. View of the Eastern portion of the curtain wall, now built into the field wall\farm boundary. The wall that seperates the road from the castle courtyard is made up of the lower few feet of the remains of the curtain wall....either in its original make-up, or rebuilt for this purpose. 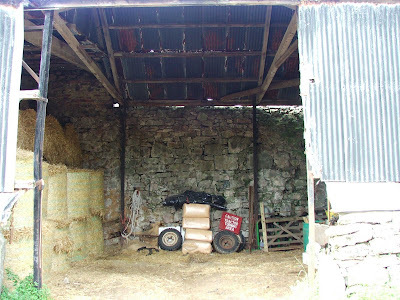 Part of the wall has also been incorporated into the cow barn that is built on the verge of the road. This photo shows the remains of the North East tower...now in a very ruinous state. The sandstone window still remains in-situ, as is the case on many of the higher windows in the castle ruins. The South East tower remains are also in a perilous state. The rear of the South East tower is still intact enough to be able to see passageways, windows and walkways built within the walls. 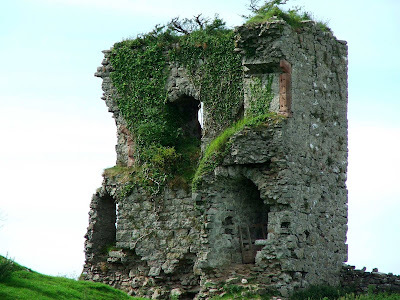 There still appears to have been no work done on the remains at Gleaston castle by English Heritage, although judging by the state of the ruins, it would not only be a costly exercise, it would be a challenging project for anyone to undertake.